Pukka is that rare thing – a company whose very business model in itself does good. Pukka is known for its premium herbal teas in colourful packets that you’ll find on the shelves of supermarkets across the UK. What it’s less well known for are its really impressive sustainability credentials – every single one of its tea blends and herbal remedies comes from wild farmland that Pukka has cultivated across the world, creating habitats for wildlife and jobs for farmers along the way. It’s a great brand story with sustainability at its heart but surprisingly little had been done to communicate this. So when Pukka decided to create a charity tea to raise money for WWF-UK it seemed like the ideal opportunity to tell this story of a tea company that’s doing more than just making a packet. This was something of a dream brief for us for a number of reasons. Here was a consumer-facing brand with a genuinely interesting sustainability story to tell – no green wash to speak of. 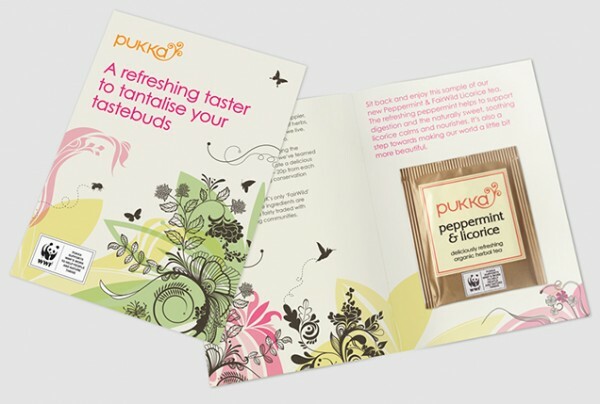 Added to that was our genuine love for Pukka’s products – we’re perhaps the only design agency in the world to be fuelled by herbal teas rather than black coffee. The opportunity to create a consumer-facing campaign for both a brand and a subject (sustainability) close to our hearts was irresistible. These are the briefs that make you happy you have the job you do. We take the view that an organisation’s sustainability brand shouldn’t sit separately to its bigger brand. It should come from and reinforce the same proposition. Whatever you think of Apple’s sustainability credentials, its sustainability proposition – ‘making things better’ – does at least come from its bigger brand story of eliminating the unnecessary to leave only the perfectly essential, for example. Finding this common thread is perhaps much easier with a brand like Pukka than a technological giant. That was our first step with this brief – to establish how Pukka’s sustainability story could reinforce its brand story. Inspiration came, as is often the case, in the Neo kitchen, where a wall of Pukka’s tea packets were stacked up like an art installation. “No one hides Pukka teas in their cupboard” Pukka MD Tim Westwell remarked. It’s true. Pukka teas are the sort you put on display to make your kitchen look a bit prettier. This is what the brand is good at – bringing a little bit of loveliness into our world, whether it’s through the creation of hundreds of acres of organic farmland or just the bright packaging in an office kitchen. So came ‘Create a Beautiful World’ – a line that spoke to the brand’s credentials as producers of beautiful tea but also its efforts to protect and nurture the natural world. When you have a strong idea or proposition like that everything else seems to fall into place. The campaign creative would be about creating beautiful spaces – in print ads, in stores and online. We worked with illustrator Oda Sonju to create a bespoke visual identity for the campaign, alongside some targeted on-pack messaging. We also delivered the digital strategy for the campaign. As with most campaigns, some bits worked, some bits didn’t. 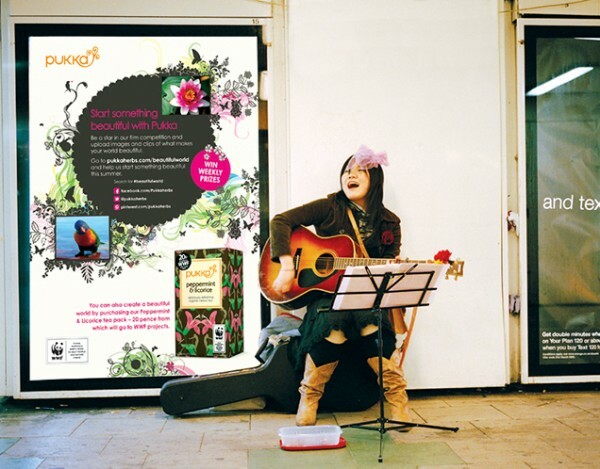 While the print creative looked beautiful and the tea pretty much sold itself, the online element of the campaign – encouraging people to upload their own images of what made their world beautiful – didn’t really take off in the way we hoped. Perhaps a combination of hosting it on website designed more for e-commerce than interaction and overestimating customer’s willingness to engage were to blame here. That aside, the campaign was a success. The tea raised over £50,000 for WWF-UK. 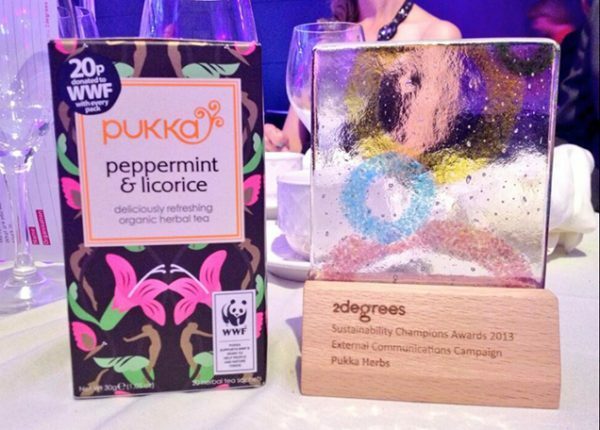 The campaign itself was awarded Best External Communications Campaign at the 2Degrees Sustainability Champion Awards 2013 – a great result for Pukka’s first real consumer-facing campaign. And our wall of Pukka tea? It continues to grow.